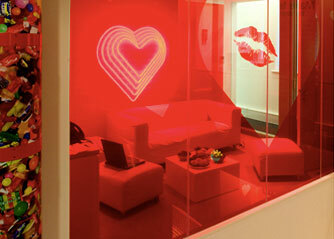 "Entering [Virgin's headquarters] through glass doors, the space delivers its first Virgin brand surprise: a greeting projected onto the reception desk – just for you. Following a generous 'sweetie tube', whose candy dispensing points on every floor connect the spaces, the eye is drawn up through the three-storey atrium and past glass-walled meeting rooms that are themed to represent the sentiment behind the Virgin values..."
"Respectfully displayed behind curved glass, a full- size cockpit, fuselage and row of check-in desks bring the core ingredients of commercial aviation into the communal space and the training room. Reminiscent of an airport viewing deck with floor-to-ceiling windows, the excitement of airport arrivals is evoked and here the majesty of flight is celebrated. A place for reconnecting with colleagues, the experience is enhanced by fun touches such as programmable message boards." "Branson's entrepreneurial spirit echoes throughout the environments at Virgin... [The spaces are] a key part of delivering the Virgin brand experience, acting as a conduit for expressing the brand personality, instilling a sense of self-worth and inviting people to feel comfortable, be themselves and ultimately help deliver the brand experience to delighted customers."